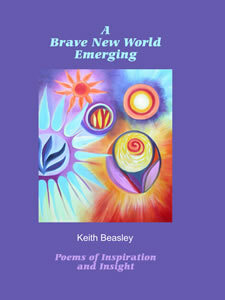 Keith's anthology of 'poems for the journey' or, more accurately, poems from his own path of self discovery which we hope will help others on their journey through this life to a better one - here and now. Containing 35 poems written during his years of quest and questioning, Keith explores the BIG issues like 'Who am I? ', 'What am I?' and other such 'meaning of life' questions. If you're thinking that there's something wrong with this world or that there's more to life than the one you're currently living, then this book will provide much food for thought and perhaps a few answers. These are authentic and powerful poems written with a conscious intent to find truth. Their content is often profound and insightful . Their effect moving and thought provoking. Their form and style full of variation and originality. Most of all, this anthology offers hope: that our world, despite all its troubles; our species, despite it's current stress and dissatisfaction levels, IS changing. In our minds many of us ARE seeing a Brave New World emerging. And it's our inner work, in facing our conditioning for example, that is enabling this evolutionary process. In sharing his process of mental change, Keith encourages us all to write our own poems and to keep up our own quest for meaning, peace and joy in our lives.